Yu-Gi-Oh! TRADING CARD GAME Soul Fusion Special Edition is jam-packed with value! Not only does it include 3 booster packs of Yu-Gi-Oh! TRADING CARD GAME Soul Fusion, each box is guaranteed 1 of 2 Super Rare variant cards, as well as 1 of 2 Super Rare preview cards of non-foil cards from the upcoming Winter 2019 booster set! Twin-Headed Thunder Dragon was one of Dueling’s first Fusion Monsters. Lauded for the ease at which you could assemble its Fusion Materials, this classic monster has been reborn for a new era! But that’s not all: an entire new family of Thunder Dragons based on the strong but simple effect of the original one arrives to add a charge to your Duels! Cards from the Yu-Gi-Oh! VRAINS animated series, including Duelists’ first chance to get cards used by Soulburner and his AI partner, Flame. 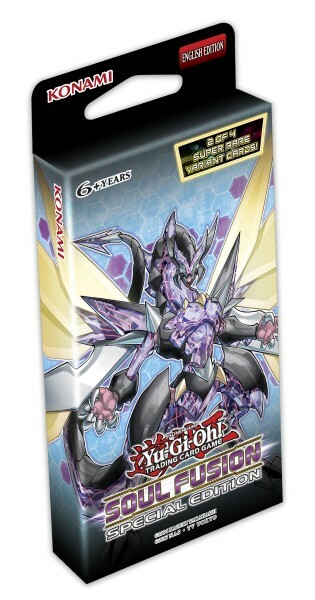 Playmaker’s Cyberse Fusion Monster, Cyberse Clock Dragon also makes its real life debut. This monster’s ATK can easily clear 10,000 if you choose the right Fusion Materials!